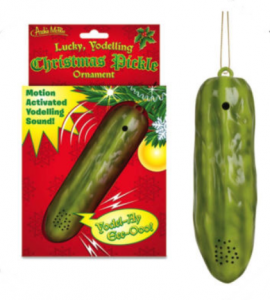 The lucky yodeling gherkin as advertised on Ebay. Advent botany enters its third year to the sound of a yodeling gherkin; but why? It started with a list of the weirdest Christmas traditions in the Telegraph newspaper and resulted in me reading about a tradition that does not seem to be traditional or to have any kind of agreed origin – a wonderful apocrypha. It’s all because of a disputed story about a pickle on a Christmas tree. There seem to be three competing origins for the Christmas pickle: 1) It’s an old German tradition; 2) it arose in the American Civil War and 3) it’s a medieval story about two Spanish boys trapped in a barrel and saved by St Nicholas. I’m not a German scholar but I do know that glass Christmas tree ornaments originated in Germany many centuries ago, and some were in the shape of fruit or nuts. However I can find no direct evidence of a pickle-shaped bauble. 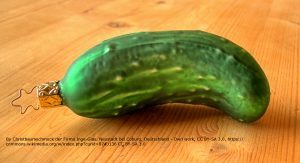 The most authoritative source debunking the idea of an ancient German origin for this item is on the blog The German Way & More which states with great confidence that almost no-one in Germany has heard of the supposed tradition of hiding a pickle-shaped ornament on a Christmas tree. Picture Andersonville prison, Georgia, during the American Civil War, soldier John Lower has been captured, incarcerated, is starving and is near death. He begs for a last pickle to eat before he died. The prison guard provided this pickle which Lower ate and this gave him the physical and mental strength to recover and survive his incarceration. He celebrated the serendipitous pickle by hiding one on his Christmas tree saying that the family member who found the pickle would have good luck and good fortune. Unless he was really hiding a pickled gherkin on his tree (in which case the smell would have made it easy to find) he would have had to wait some 15 years before F. W. Woolworth imported the first glass tree ornaments from Germany in 1880, and even then there is no evidence a glass pickle was amongst the ornaments imported. A medieval story of two boys on their way home from boarding school for Christmas who stopped overnight at an inn and were killed and put in a pickle barrel by an innkeeper. St Nicholas visited the Inn that very same night and found the boys, brought them back to life and rescued them. However it is also reported that the original version of the story has a barrel used to store meat pies and not pickles. Whatever the truth, there are now many gaudy Christmas pickles to be bought and hung on your Christmas tree. If you really want to celebrate the pickle at Christmas then you might try the Christmas Pickle Festival in Berrien Springs which started in 1992 and reported as current as recently as 2012 but sadly the pickle seems to have vanished from Berrien Springs festival which is now called ‘Kindle your Christmas Spirit‘ and is happening today (1st December) but lacks any mention of pickles. Perhaps the Christmas pickle is dying out and in need of conservation? Or perhaps it is time to stop sticking a gherkin on the Christmas tree? You can buy a range of gherkin Christmas tree decorations on the web (and I suspect in all good Christmas decoration stores). But what is a gherkin/pickle? Having waded through the confusion of stories about the origin of the Christmas Pickle it seems appropriate to spend a few words on the confusion over what is a gherkin. 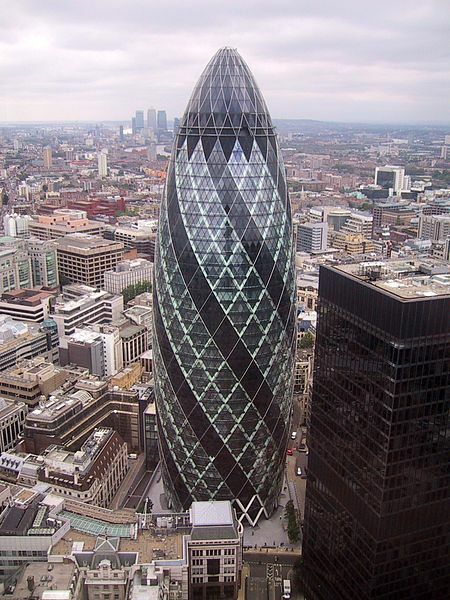 For s start a gherkin and a pickle are the same thing in different places; north America tends to use the word ‘pickle’ while the UK uses the word gherkin. While these words mean the same thing, in fact two quite different species in the plant family Cucurbitaceae are used to produce gherkins (pickle in the U.S.): Cucumis anguria and Cucumis sativus (Purseglove 1968). Cucumis anguria is the West indian Gherkin and is used in pickles, as a cooked vegetable and an ingredient in curries. However, most of the pickles sold are not from this species but from Cucumis sativus, the cucumber. The cucumber is available in many hundreds of varieties and some are reputedly better than others for pickling. Purseglove, J W 1968. Tropical Crops: Dicotyledons. Longman, London. This entry was posted in Advent, Public Engagement with Science and tagged Cucumis anguria, Cucumis sativus, gherkin, pickle, yodelling. Bookmark the permalink.